FILE - A heavy rainstorm resulted in a swollen creek in Pennsylvania. 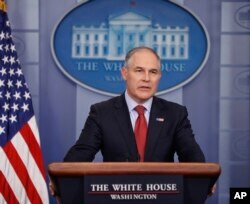 FILE - EPA Administrator Scott Pruitt speaks to the media during the daily briefing in the Brady Press Briefing Room of the White House in Washington, June 2, 2017. No one disputes that the 1972 Clean Water Act allows federal agencies to regulate navigable rivers and lakes. Less certain is the status of some 2 million miles of headwaters and streams that flow only part of the year — 60 percent of the river and stream miles in the Lower 48 states — plus 20 million acres of wetlands that aren't directly connected to large waterways. Under the Obama interpretation, those waters are protected. Business groups and some Republican state officials — including then-Oklahoma Attorney General Scott Pruitt, now Trump's EPA chief — filed suit, contending the regulation gave federal officials too much authority over waters that don't cross state lines or have a clear link to waters that are covered. The regulation was in effect for a short period in 2015 before the appeals court issued a stay. Those legal challenges are still pending. Response to Tuesday's announcement largely fell down party lines, with congressional Republicans hailing the move. The rule "would have put backyard ponds, puddles and prairie potholes under Washington's control," said Sen. John Barrasso, a Republican from Wyoming, chairman of the Senate Committee on Environment and Public Works. "I applaud the Trump administration for working to remove this indefensible regulation." The Trump administration's proposed withdrawal will require a 30-day public comment period, after which EPA and the Army Corps would have to consider the reaction and the make a final decision — which likely will draw suits from groups that favor the regulation. In his executive order, Trump instructed the agencies to redesign the rule in keeping with a 2006 opinion by the late conservative Supreme Court Justice Antonin Scalia. He interpreted federal jurisdiction narrowly, saying only "relatively permanent, standing or continuously flowing" waters or wetlands with a surface connection to navigable waterways are entitled to federal protection. "Farmers and ranchers across this country are cheering," said Zippy Duvall, president of the American Farm Bureau Federation. He said the Obama rule was "a federal land grab designed to put a straitjacket on farming and private businesses across this nation." Rhea Suh, president of the Natural Resources Defense Council, said withdrawing the rule "would make it easier for irresponsible developers and others to contaminate our waters and send the pollution downstream. We'll stand up to this reckless attack on our waters and health."